Turangalîla is a symphony of love, but also much more. 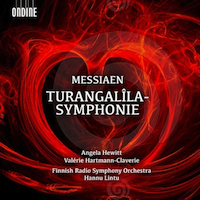 The composer himself described his symphony with the following words: “Turangalîla means all at the same time song of love, hymn to joy, time, movement, rhythm, life and death”. The work was premiered in 1949 by the Boston Symphony Orchestra conducted by Leonard Bernstein.